I only ever had one pet. It was a tabby cat. I called it Thomas. My sister called it Fluffy. My dad called it Cat. It would forever be known as Thomas Fluffy Cat. Then TFC ran off, probably to a derelict pig farm at the end of our road that was the headquarters to a gang of ferals. A strangely familiar looking cat turned up at one of my best friend’s house a few years later. It was curiously attracted to me, and I remain convinced that it is TFC, or at least one of his messengers. But this is all besides the point. 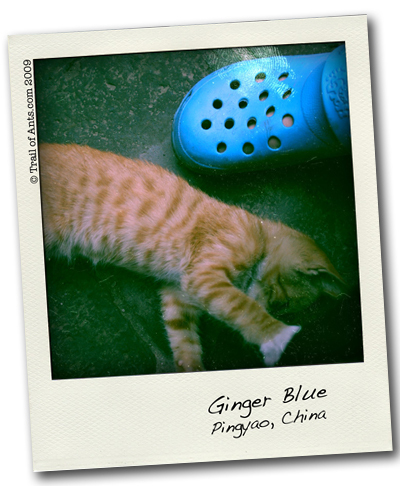 None of the above has anything to do with the irresistibly cute ginger kitten in the image below. Meme was the resident cat at my hostel in Pingyao, a small culturally significant town not far from Beijing. The garish shoe is mine too. I remain a stout fan of the Croc and all affiliated footwear, and stand by my claim that it is the most versatile shoe you could ever wish for in a backpack. Odourless. Rainproof (due to it allowing rain to run out of the holes). Sturdy. Compact (kind of, with a bit of squeezing).